Wycliffe Bible Translators: Translating For The Devil! Wycliffe Bible Translators was founded in 1942 by William Cameron Townsend. In l9l7-l8, when young Cameron Townsend tried to sell Spanish Bibles in Guatemala, he discovered that the majority of the people he met did not understand Spanish. Neither did they have a written form of their own beautiful language, the Cakchiquel. Townsend abandoned his attempts to sell Bibles and began living among the Cakchiquels. He learned their complex language, created an alphabet for it, analyzed the grammar and translated the New Testament in the remarkably short span of ten years. As a result, Townsend resolved that every man, woman and child should be able to read God’s Word in their own language. Since its inception, Wycliffe has made great progress in Bible translation all around the world. To date, Wycliffe has played a part in completing more than 700 Scripture translations. John Wycliffe (1320-1384) was an Oxford professor, scholar, and theologian. He initiated the first translation of the Bible into the English language in 1380’s AD. John Wycliffe was considered the main precursor of the Protestant Reformation – an early proponent of reform in the Roman Catholic Church during the 14th century. He was well known throughout Europe for his opposition to the teaching of the organized Church, which he believed to be contrary to the Bible. With the help of his followers, called the Lollards, and his assistant Purvey, and many other faithful scribes, Wycliffe produced dozens of hand-written English language manuscript copies of the scriptures. They were translated out of the Latin Vulgate, which was the only source text available to Wycliffe. The Pope was so infuriated by his teachings and his translation of the Bible into English, that 44 years after Wycliffe had died, he ordered the bones to be dug-up, crushed, and scattered in the river! Wycliffe was born at Ipreswell (modern Hipswell), Yorkshire, England, between 1320 and 1330; and he died at Lutterworth (near Leicester) December 31, 1384. Now was that impressive or what? John Wycliffe stepped on the toes of the Roman Catholic Church by giving the people of England a translated English copy of the Holy Bible. Because up until that time, if you really wanted God’s Word you had one of two choices: either receive it second hand through the mouth of the unholy prophets (popes and priests) of the Roman Catholic Church, or read it in the Hebrew, Greek, or Latin languages. So, would you like to know what Bruce A. Smith confessed to me… and he didn’t even know he was confessing it? I have trouble sleeping. When I think about the millions who still wait for even a single word of Scripture in their own heart language, it keeps me awake. ". . . There before me was a great multitude that no one could count, from every nation, tribe, people and language, standing before the throne and before the Lamb. They were wearing white robes and were holding palm branches in their hands " (NIV). Wow! No wonder he can’t sleep at night! I mean, please believe me when I say that this revelation from God, as spoken through Bruce A. Smith, really and truly made me sick to my stomach. Because you see the revelation that I received, through Bruce A. Smith’s very own letter, is that he, as an integral part of “Wycliffe Bible Translators”, is not at all concerned about getting the True Word of God to the millions of people who have yet to receive the Holy Bible in their native tongues. I mean, after all, he did quote Revelation 7:9 from the Devil’s own bible: the New International Version (NIV)! Wycliffe Bible Translators is named after John Wycliffe since he was a pioneer in putting the Scriptures into the everyday language of the people. He wanted people to be able to read and understand the Scriptures for themselves. That's what Wycliffe Bible Translators is all about - the people having the Scriptures in a language and manner that speaks best to them. As for which Bible do we use for translation, Wycliffe translators use various Bibles, commentaries and the Hebrew and Greek to do a Biblically accurate culturally understandable Bible. I say culturally understandable because I could observe while we were in Peru that the people there stood at our gate and knocked and called out to see if we were home. For them to say " Jesus knocks on the door" in Revelation 3 would indicate he was a thief being sure no one was home before he broke in to steal something. So the translation for them would have Jesus standing at the gate where he knocked and called their name. The meaning is the same and is understood because their cultural norms were used. This paper explains the policy of Wycliffe Bible Translators and SIL, International on the Hebrew and Greek texts on which Bible translations are based. All of us in Wycliffe Bible Translators have a deep concern that the message of the Scriptures should be faithfully transmitted…. Our members all believe in the inspiration and authority of the Holy Scriptures and are committed, as God enables us, to translating the message without change or distortion. For the Old Testament, our translators follow the standard Hebrew (Masoretic) text of the Old Testament… In places where there are difficulties in interpreting the Hebrew text, insights from other Semitic languages and from ancient versions, such as the LXX, should be taken into account. New modern language translations, such as NIV, NASB, and NRSV, reflect recent textual studies and provide helpful models. The Hebrew text, however, should be given priority, wherever possible. Most of our translation personnel are not textual experts, and so follow the text that is generally accepted to be the standard recommended by scholars in this field, namely the Nestle-Aland text, 26th or 27th edition. This is also the text provided in the United Bible Societies 3rd and 4th editions of the Greek New Testament. The New Testament of the King James Version Bible was translated from the “Textus Receptus” (Latin for Received Text), or the majority text (since it is represented by 95 % of all the manuscript evidence)… but yet the “new versions” – New International Version (NIV), New American Standard Bible (NASB), and New Revised Standard Version (NRSV) – were heavily influenced by two manuscripts of the school of Alexandrian (the “corrupted text”). So, there are two kinds of manuscripts used in translating today’s Bibles: the “accurate copies” and the “corrupted copies”. The “accurate copies” represent the manuscripts from which the "Textus Receptus" (Received Text) was taken. They are the majority of Greek manuscripts that agree with each other and have been accepted by Bible believing Christians down through the centuries. It is from these manuscripts that the King James Version was translated in 1611. The “corrupted copies” (also known as the Alexandrian manuscripts), are the manuscripts used by Satan in the “new versions” to corrupt God’s Holy Word. Because you see there are 5,309 surviving Greek manuscripts that contain all or part of the New Testament. These manuscripts agree together 95% of the time. The other 5% account for the differences between the King James Version and the “new versions”. The “new versions” had to use the “Textus Receptus”, since it contains the majority of the surviving Greek manuscripts. However, when the “Textus Receptus” disagreed with the “corrupted copies” (Vaticanus and Sinaiticus manuscripts are part of this group), the “new version” translators chose to use the “corrupted copies” instead of the “Textus Receptus”… which accounts for the 5% corruption in the “new versions”. And by the way, many times the “corrupted copies” do not even agree with each other. So go figure! But let’s not stop there. 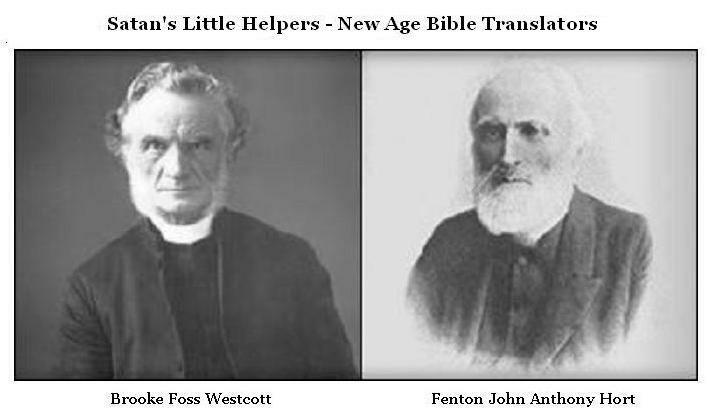 Because you see this “Nestle-Aland” Greek text, the one that “Wycliffe Bible Translators” have authorized as a standard for those “Wycliffe translator personal who are not textual experts”, was actually brought into being through the efforts of two of Satan’s right hand men: Brooke Foss Westcott (1825-1903) and Fenton John Anthony Hort (1828-1892). “Westcott and Hort” were directly responsible for the first New Testament “new version” of the King James Version Bible: the “Revised Version” of 1881. Because it was through the corrupt manuscripts of the school of Alexandrian (Vaticanus and Sinaiticus manuscripts) that “Westcott and Hort” produced the Greek text that was used to translate the “Revised Version” of 1881. And it’s this very same “Westcott and Hort” Greek text that has gone on to produce the “Nestle-Aland” Greek text used by “Wycliffe Bible Translators”. The United Bible Societies (UBS) Nestle-Aland Greek New Testament - used in 95% of seminaries today - is essentially the product of the German Bible Society; they retain the Copyright on the Nestle-Aland Greek Text. The German Bible Society does not follow Protestant Theology. The German Bible Society despises Martin Luther, His Bible and the Textus Receptus, and instead seems committed to promoting Bible Texts that (a) were rejected by the Christian Church for thousands of Years and (b) that "coincidentally" seem to greatly favor Roman Catholic Theology. 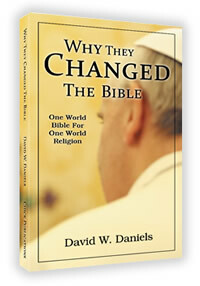 For the Greek New Testament used by the German Bible Society/UBS, they (UBS) hired the head of Theology of the Roman Catholic Church, the head of the Pontifical Institute in Rome (which trains the best of the Roman Catholic Theologians and Priests), to be one of the main overseers of the Greek Text (Nestle-Aland) that is being used by almost all Protestant Seminaries in the USA today. Can you believe it? The same religious system that John Wycliffe protested by producing the Wycliffe Bible that infuriated the Pope to the point of desecrating his remains 44 years after his death is now being promoted by “Wycliffe Bible Translators”. Do you think that just maybe John Wycliffe would be a tad bit upset with “Wycliffe Bible Translators” for desecrating his good name through their very evil atrocities? But anyway, “Westcott and Hort” took the Holy Bible – King James Version – and made it unholy! It was a natural thing to do! I mean, after all, Westcott didn’t even believe that Jesus was the Christ; he denied that Jesus ever recognized Himself as the Son of God. And from that “early beginning” we now have the NIV that Bruce A. Smith quoted in his “letter of confession” that helped me see the undeniable corruption within the “Wycliffe Bible Translators” organization. The Jehovah's Witnesses are a cult. They believe that Jesus was only a manifestation of Michael the archangel in human form; a mere created being. They do not believe Jesus was God manifested in the flesh for the purpose of redeeming mankind from the everlasting fires of Hell through His sacrificial death on the cross. And in order to make this unbelievable lie believable, they produced their very own Bible – the “New World Translation” – through the help of the same “Westcott and Hort” Greek text that helped produce the NIV. Unbelievable? Well, if you were to do a one-on-one comparison of the verses in the King James Version with those in the NIV you would find dozens of places with subtle but consistent omissions and alterations which chip away at doctrines concerning Christ's redemption, deity, virgin birth, miracles, priesthood and second coming. In fact a study was conducted of 147 words or verses that were found omitted in the NIV, and 146 of those same words or verses were also left out of the Jehovah's Witnesses’ “New World Translation”. In other words, the same Devil that produced the Jehovah’s Witness cult and it’s “New World Translation” also produced the NIV. So are you starting to get the picture? Are you starting to see why (?) the title of this sermonet is “Wycliffe Bible Translators: Translating For The Devil!” Are you starting to see why Bruce A. Smith has trouble sleeping at nights? I. In the end of the former chapter there is mention made of holy men of God, who lived in the times of the Old Testament, and were used as the amanuenses of the Holy Ghost, in writing the sacred oracles; but in the beginning of this he tells us they had, even at that time, false prophets in the church as well as true. In all ages of the church, and under all dispensations, when God sends true prophets, the devil sends some to seduce and deceive, false prophets in the Old Testament, and false Christs, false apostles, and seducing teachers, in the New. Concerning these observe, 1. Their business is to bring in destructive errors, even damnable heresies, as the business of teachers sent of God is to show the way of truth, even the true way to everlasting life. There are damnable heresies as well as damnable practices; and false teachers are industrious to spread pernicious errors. 2. Damnable heresies are commonly brought in privily, under the cloak and colour of truth. Those who introduce destructive heresies deny the Lord that bought them. They reject and refuse to hear and learn of the great teacher sent from God, though he is the only Saviour and Redeemer of men, who paid a price sufficient to redeem as many worlds of sinners as there are sinners in the world. 4. Those who bring in errors destructive to others bring swift (and therefore sure) destruction upon themselves. Self-destroyers are soon destroyed; and those who are so hardened as to propagate errors destructive to others shall surely and suddenly be destroyed, and that without remedy. II. He proceeds, in the second verse, to tell us the consequence with respect to others; and here we may learn, 1. Corrupt leaders seldom fail of many to follow them; though the way of error is a pernicious way, yet many are ready to walk therein. Men drink in iniquity like water, and are pleased to live in error. The prophets prophesy falsely, and the people love to have it so. 2. The spreading of error will bring up an evil report on the way of truth; that is, the way of salvation by Jesus Christ, who is the way, the truth, and the life. The Christian religion is from the God of truth as the author, leads to true happiness in the enjoyment of the true God as the end, and works truth in the inward part as the means of acceptably serving God. And yet this way of truth is traduced and blasphemed by those who embrace and advance destructive errors. This the apostle has foretold as what should certainly come to pass. Let us not be offended at any thing of this in our day, but take care that we give no occasion to the enemy to blaspheme the holy name whereby we are called, or speak evil of that way whereby we hope to be saved. So, that about wraps up another adventure in “snake hunting #101”. 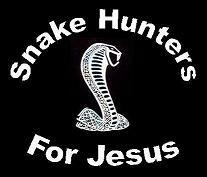 Never would I have ever imagined that “Wycliffe Bible Translators” and their associate are infested with snakes! But they are… and we have just proved it! Bible translators all over the world are making Bibles that they think are only for Protestant and Baptist believers. But they've been sold a lie! Actually, they have been tricked into also making false bibles for someone else. Most don't know that Christian translators are being trapped into helping create a One-World Bible! And all the translation work is paid for by contributions from Bible believers like you. All of us in Wycliffe Bible Translators have a deep concern that the message of the Scriptures should be faithfully transmitted. It is a top priority that the translations we work on should be as faithful as possible to the original text in every detail, communicating the message accurately and clearly. Our members all believe in the inspiration and authority of the Holy Scriptures and are committed, as God enables us, to translating the message without change or distortion. For the Old Testament, our translators follow the standard Hebrew (Masoretic) text of the Old Testament. This is the text established by the Masoretes, Hebrew scholars who worked between the sixth and eleventh centuries A.D, who did much careful study to achieve a standard text, working from earlier manuscripts. When Hebrew scribes copying this text realized that an earlier copier had made an error, they would nevertheless faithfully copy the text as it stood---not daring to modify the sacred text. In the margin, however, they would write what they believed to be the correct reading. The very fact that they behaved in this manner gives us great confidence in the scrupulousness with which they copied the Old Testament Scriptures. In places where there are difficulties in interpreting the Hebrew text, insights from other Semitic languages and from ancient versions, such as the LXX, should be taken into account. New modern language translations, such as NIV, NASB, and NRSV, reflect recent textual studies and provide helpful models. The Hebrew text, however, should be given priority, wherever possible. Concerning the Greek text of the New Testament: None of the original manuscripts, written by the author, has survived, so the Greek manuscripts that we have are all copies. The early Greek New Testament manuscripts were copied by hand many times (further copies being copied from copies). In the course of copying, occasionally a scribe miscopied a word, or omitted a word or a line, or even added a phrase. In fact, of the 5000 early Greek manuscripts that exist, experts tell us that there are no two that are identical in every detail. But although there are many small differences, there are very few that make a difference to the meaning and none which crucially affect any basic issue of Christian doctrine. It is amazing to see how God has wonderfully preserved the integrity of the text over the centuries. The King James Version is based on the Textus Receptus. This is an eclectic text compiled by scholars in the late sixteenth century. Scholars, notably Erasmus, Beza and Stephanus, studied the limited number of Greek manuscripts available to them at that time, which dated mainly from the 11th to the 13th century. Where there were different readings in the manuscripts, they carefully made a decision on which seemed to have been the author’s original text. After several revised editions, a text was published which contained in its preface the statement that this was now the textus receptus, i.e., the received text, accepted as authoritative. Some of the earliest and most reliable Greek manuscripts, however, have only been discovered or become available to scholars during the last one hundred and fifty years. Some of these newly discovered manuscripts date back to the third and fourth centuries A.D. There is no question as to the authenticity of these manuscripts. Scholars agree that they are genuine. Recent scholars have done the same thing that Erasmus and Stephanus tried to do, namely to look at all the manuscripts that are now available and to try to discern what the author’s exact original wording was. In doing so they have taken into account a combination of factors, including the number of manuscripts that have a certain reading, and the date and distribution of the manuscripts. For example, if a certain reading is found in many manuscripts that are widely distributed, this is strong evidence that this was the original reading. Textual issues are judged by whether the evidence indicates that certain words (or letters) in the text were written by the original author or whether something has been added later, or changed, by a copyist. For example, words that occur in almost all of the earliest Greek manuscripts, and which occur in many manuscripts, can be judged to be original. The great majority of the New Testament text has this degree of certainty. Much study has been done by many careful and godly scholars. Amongst them were Nestle and Aland and the Nestle-Aland text has become widely accepted. This text takes into account the more recently discovered manuscripts and this is the main reason for the differences from the Textus Receptus. Eminent believing scholars of the highest reputation among conservative evangelical Christians agree that the additional manuscript evidence that has now become available to scholars should not be disregarded. Some questions still remain, however, and research continues. There is no evidence or likelihood that any major change in the Scriptural text will result from this further research. It might very occasionally be that in a very few passages, a reading that now appears in a footnote will later become the recommended reading in the text. Today the main alternative text to the Nestle-Aland is the Majority Text. The Majority Text is based on the principle that the reading found in the largest number of manuscripts is the right one. This does not take into account other factors such as the date of the manuscripts, their relationship, or their geographical distribution (whether the manuscripts that have a certain reading all came from one region, or whether they were found in widely distributed locations). In some areas, especially the Byzantine area, Greek was the language used in the churches and so a lot of copies of the Scriptures were made in that area (in contrast to the Western area, where Latin was more widely used). Often many copies were made from one source manuscript -- if that source manuscript had a certain reading, all the copies made from it would have this reading too. For this reason most scholars feel that the criterion of the number of manuscripts that have a certain reading is not sufficient alone; it has to be weighed with other criteria, such as date, geographical distribution, and the relationship between manuscripts. Any significant alternative textual readings are noted in most major language editions of the Bible in footnotes (e.g. “some ancient manuscripts read. . .”) These footnotes are limited to places where the difference in the Greek texts could make a difference of meaning in the English translation. Carson, D. A. 1979. The King James Only Debate: A Plea for Realism. Grand Rapids: Baker. Greenlee, Harold. 1985. Scribes, Scrolls and Scriptures. Eerdmans. Holmes, Michael W. 1989. ‘New Testament Textual Criticism’ Chapter 2 in Introducing New Testament Interpretation, edited by Scot McKnight. Baker Book House. White, James R. 1995. The King James Only Controversy: Can You Trust Modern Translations? Minneapolis, Minnesota: Bethany House Publishers. On passages such as the Gospel of Mark chapter 16:9-20, and the Gospel of John chapter 7:53–8:11, all our translations include these verses. If translators feel there are good reasons for following an alternative textual reading at any point, they need to show strong evidence from the Greek manuscripts for this. In places where there is a significant question on a textual issue, a footnote may be included to explain the alternative possibility, as is done in English Bibles. In making these decisions, careful consideration is given to the convictions of church leaders in the area where the translation is being made. For example, if church leaders in the area prefer to follow the Textus Receptus, this may be done. Footnotes giving the translation of the readings recommended in the Nestle-Aland text should, however, also be included. All those involved in Bible translation need wisdom from God in making the right decisions, in textual matters and in the many other problems of translation. Translating is a great challenge and heavy responsibility. It is also very thrilling to see people who have never before heard God’s Word in their own language listening or reading and coming to know the Truth. Please pray that God will guide each one who translates. Our goal is to pass on the wonderful message of the Gospel in all its truth. Our International Translation Coordinator will be pleased to interact on questions relating to this subject. 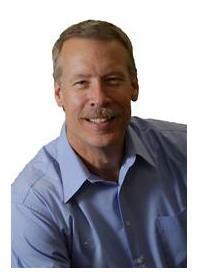 E-mail Freddy_Boswell@sil.org or phone (972)-708-7307.